El Dorado Maroma is an adults-only all-inclusive resort located on Riviera Maya’s Maroma Beach, which was named one of the 10 best beaches in the world by Travel Channel. With 30 overwater bungalows — the first and only in Mexico — El Dorado Maroma brings the overwater bungalow vibe within easy flying distance from the US. 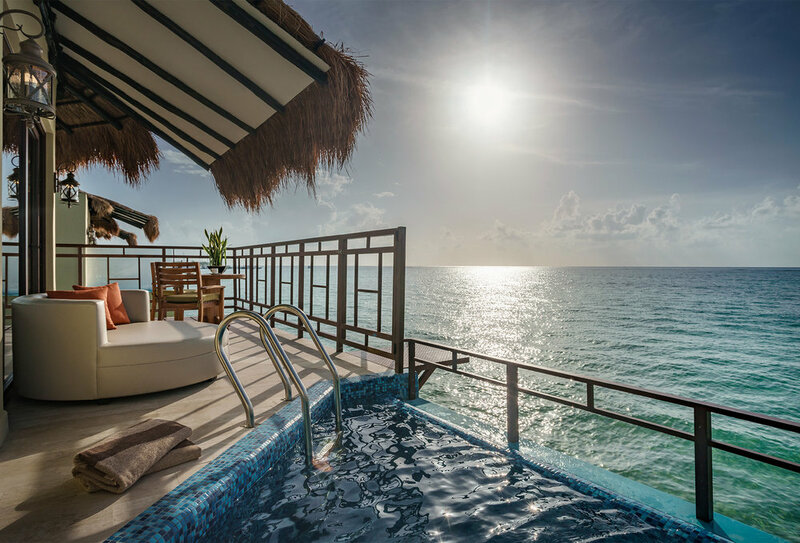 The resort has 158 suites: jacuzzi junior, honeymoon, Mi Hotelito Beachfront suite, private pool jacuzzi suite and swim up jacuzzi suites, in addition to the overwater bungalows. 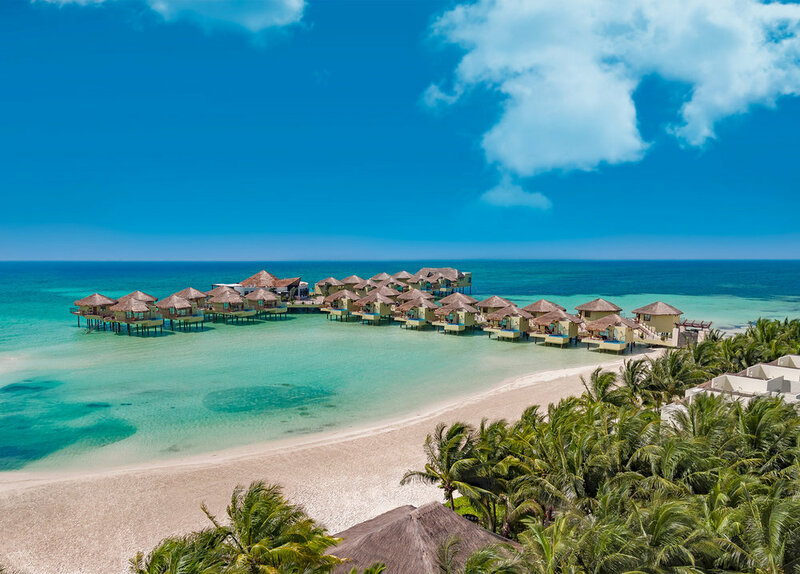 The overwater bungalows which are referred to as Palafitos by the resort, make up an exclusive resort-within-a-resort at El Dorado. Activities and amenities are shared, however, the service and food are higher quality in the Palafito section. There are two types of overwater bungalows: beach facing and ocean facing. Like most overwater bungalows, there’s minimal space and privacy between bungalows. Each bungalow features a glass bottom floor, and indoor jacuzzi for two and an outdoor deck complete with lounge chairs, a private infinity pool, direct access to the ocean, and an outdoor shower. The resort has three pools, including a selection of swim-up suites, and beach butlers are available for food, towel, and sunscreen service. Land and water-based activities are plentiful and include the usual suspects like kayaks, paddle boards and yoga and some more unusual offerings like Latin dance lessons and tequila tastings. There’s an on-property fitness center, beach volleyball, and golf is available at a nearby property. Scuba diving and motorized water sports are available for an additional fee. The resort has ample dining and drinking choices with five bars and seven restaurants. Enjoy Mexican cuisine at Sabores, Asian at Kiyoko, Italian at Mio Cuccina Italiana, Caribbean at Caribbean Grill, Peruvian at Lima Limon, ceviche and seafood at Cabrilla, and International favorites at Papitos. For a truly romantic experience, head to the Overwater Grill & Wine Bar for gourmet dining with views of the Caribbean Sea. The dress code in all restaurants is casual elegant, which calls for long pants or Bermuda shorts for men, along with collared shirts and dress sandals. Ladies can don dresses, skirts, capris or pants along with elegant sandals. Baseball caps, tank tops, sporty shorts, and flip-flops are not permitted. The Overwater Náay Spa soothes your soul while adhering to the ancient Mayan principles of Earth, Wind, Fire, and Water. Treatments are designed based on Maya herbal practices and include the benefits of Maroma’s Sea Moss. This unique moss is found only in the Caribbean and is rich with mineral salts, making it useful for detoxifying and antioxidant boosting. Enjoy the spa’s signature Holistic Treatment, which combines the benefits of Mexican herbal remedies with aromatherapy and massage or the Tequila Ritual, which uses tequila and melon to remove dead skin cells and improve circulation. The treatment is followed with a blue agave and melon extract detoxifying clay wrap and a 30-minute massage. El Dorado Maroma offers weddings for two to 150 guests in a variety of locations on property. Choose from beach, gazebo, chapel, and palapa location options and you’ll receive expert wedding planning by a signature wedding designer to ensure that your needs and vision are met to create the wedding of your dreams. Decor, floral, photography, and entertainment packages are available. To ensure quality and personalized attention, the resort hosts no more than two weddings per day and ceremony times are typically between 4 pm - 6 pm. El Dorado Maroma is just 40 minutes south of Cancun International Airport (CUN). Ground transfers are available through the resort.